The lost art of old school note-taking is about to make an epic comeback with Sticky App Notes — the iconic iOS post-it notes that will get your happy juices flowing again. A package of 6 apps will run you $18 which includes Mail, Calendar, Messages, Contact, Notepad and Clock with plenty of room for writing. Even if you suffer from classic sausage fingers. The only downside is having to wait 3 to 4 weeks for delivery since these are shipped via Pony Express. Filmmaker Josh Whedon, known for his work on “Buffy the Vampire Slayer”, “Firefly” and “The Avengers,” has released a pro Romney video just in time for Halloween. His satirical spoof is designed to prey on the fears of undecided Americans who are convinced a zombie apocalypse followed by insolvency and chaos is inevitable if they vote in Mitt Romney for President. Does anyone remember four years ago when images of a zombie John McCain went viral after he completed the final presidential debate with Obama at Hofstra University? The idea of a zombie Mitt Romney is definitely not original — in fact, it's tired and played out just like Whedon's lame jokes about Spam. Josh Whedon is an awful choice as a spokesman for the zombie apocalypse becuase he's just not believable. He's all about superheroes and vampire slayers — but he doesn't know crap about zombies. He fails to promote the positive aspects of a lumbering zombie nation. He would be the first one to piss his pants if a horde of zombies showed up at his front door. Maybe he can feed them all Spam to keep them from engorging on his skull. “If Mitt takes office, sooner or later the zombies will come for all of us” Whedon says. Wha, wha, wha! We're all going die a horrible death without Obama. An undead president isn't the worst idea — neither is a zombie nation that feeds on brains, especially if they start with Wall Street bankers. So don't fear what you can't understand people - no matter what Josh Whedon says. A sad and tragic Instagram image went viral late Monday night showing Jane's Carousel at The Brooklyn Bridge Park completely flooded in the wake of Hurricane Sandy — while the lights inside the pavilion illuminated the dark waters surrounding it. The 48 wooden horses which reside inside the pavilion located between the Manhattan and Brooklyn bridges — were restored by artist Jane Walentas who spent over 20 years on the project. The horses came from a theme park originally installed in Youngstown in 1922. Hundreds of comments left under the eerie photo captured by Andjelicaaa underscored the tragic picture — with many grieving over what could be just one of many devastating losses for New Yorkers should flood waters continue to rise. “I was there in August. My heart cries seeing all this happening.” said francychicca65. At the time of this writing, there were over 453,000 Instagram images tagged with the hashtag #Sandy. Although dozens of faked Hurricane Sandy photos populated Instagram on Monday, it was this one image that struck a nerve with New Yorkers, as well as with some as far away as Australia. “Maybe its not ruined? Maybe it can be cleaned and salvaged.” pantherspix added. Against all odds — maybe the flood waters will subside in the morning light and maybe this labor of love can survive the wrath of Sandy. The image below offers a beautiful look at the walk up to Jane's Carousel — taken just four weeks ago by Ramon Nuez. Scott Forstall, Apple's Senior Vice President of iOS software was asked to leave the company after reportedly refusing to sign his name to a letter apologizing for the Apple Maps gaff that accompanied the launch of iOS 6 — according to a Wall Street Journal report. The move is being called “one of the most significant management shake-ups in Apple's recent history” as Forstall, a 15-year Apple veteran and protégé of Steve Jobs is relegated to serve CEO Tim Cook as an adviser in the interim until his official exit from the company sometime next year according to an Apple news release. One person close to Apple's executive team conveyed that the mood of people at the company was mostly positive after learning of Mr. Forstall's departure — as reported by The New York Times. Some pundits are already speculating that Scott Forstall could ultimately end up leading the Android team at Google — although “advising” Tim Cook into next year could hold him in check through the end of 2013, making a hire by Google, Microsoft, Amazon or even Samsung impossible in the near term. Regardless of why Forstall was ousted from Apple or even if he was difficult to work with as some insiders have suggested — cheering his misfortune is simply poor form and ultimately reflects badly on those seen smirking in the bleachers. At the end of the day Forstall is still credited with building a phenomenal iOS for iPhone and iPad — a grand legacy that most of us can only dream about playing Monday morning quarterback while passing gas sitting in an overstuffed lazy boy recliner chair. Scott Forstall is going to land on his feet and end up doing just fine living life beyond the great mothership. It's not the end of the world — just the end of an era. Perfectly Clear App Now Fixes Ugly "Purple Haze"
Although Perfectly Clear has always been an essential app for simple and stunning image correction — the recent 3.0 update has added a new "De-Purple" fix designed to remove that pesky Purple Haze introduced with iPhone 5. Purple Haze is an obvious purple hue that can appear in iPhone 5 photos when shooting into the sun or capturing sources of bright light. While Apple claims that the color purple is not new to iPhone photos aimed into the sunlight, I have dozens of bright light images snapped with my iPhone 4S that look amazing — no purple overtones present at all. Glyn Evan at iPhoneography.com, previewed the Perfectly Clear Purple Haze fix a few days back and the test results he posted were quite impressive. Perfectly Clear is well worth the $2.99 price tag — especially if you're frustrated with that big purple ghost haunting your photos. I'm certain you'll find this little gem to be even more useful for noise removal, teeth whitening and rendering perfectly smooth skin. We can all use a little more teeth whitening. Steve Jobs said; “I want to put a ding in the universe.” — but it was Olive Bird who decided to put a ding on the side of a common shirt button to keep our dangling EarPod cords neat and tidy. Say hello to Button 2.0 — the art of building a better button. By adding a slot on the side of a common button, Olive Bird has transformed ordinary into extraordinary — forever changing the garment universe for generations to come by adding a simple cable-wrangling design. Button 2.0 costs $3.28 each and is expected to ship by November 8th. The thread and sewing part is up to you. Yes sir... it certainly is. This banned iPad mini video offers key insights into why Apple's smaller iPad preorders sold out in just one weekend. Even people who already own a Kindle bought one. "iPad mini is the future — it's the future until May at least, probably more like the end of May." Are iPhone Users Battling A Text Neck Epidemic? Move over tennis elbow — text neck has arrived. There are plenty of maladies in our modern age, but a new one has been introduced as a by product of the growing smartphone revolution. And it's not simply a malady any longer, it's been classified as a "world-wide health concern" by Dr. Dean L. Fishman, Chiropractic Physician. The Text Neck Institute talks about the added risks of this repeated stress injury and warns if left untreated, it can eventually cause permanent damage. Americans on average spend about 2.7 hours per day on their smartphones and even more time looking down while searching the web. Hunching over to read on a tiny portable device causes undue stress on your neck and shoulders — resulting in headaches as well as creating a huge pain in the neck from poor posture. It's so common that it has been coined "text neck" by Dr. Fishman. "The average human head weighs 10 pounds in a neutral position -- when your ears are over your shoulders. For every inch you tilt your head forward, the pressure on your spine doubles. So if you're looking at a smartphone in your lap, your neck is holding up what feels like 20 or 30 pounds." While I'm not quite convinced that text neck is a "global epidemic" as Dr. Fishman calls it— the remedy is remembering to take frequent breaks from your devices (about every 20 minutes to stretch). And if you can't, The Text Neck Institute created a mobile app, "Text Neck Indicator" to keep your device correctly positioned while reading. "Text Neck is not just a texting problem," says Dr. Dean Fishman. "Text neck is a gaming problem. Text neck is an e-mailing problem." Steve Jobs returns as a halogram to hype up the launch of iPad mini and send Jeff Bezos packing with Amazon's "Kindull Fyre". If you missed the original "Steve Jobs iPhone 5" animated video — it's worth a look. Since the original iPhone first hit Apple store shelves in 2007 unrelenting rumors of iPhone red have been tossed around like the mythical Unicorn — but Steve Jobs never dared to deviate beyond black and white. 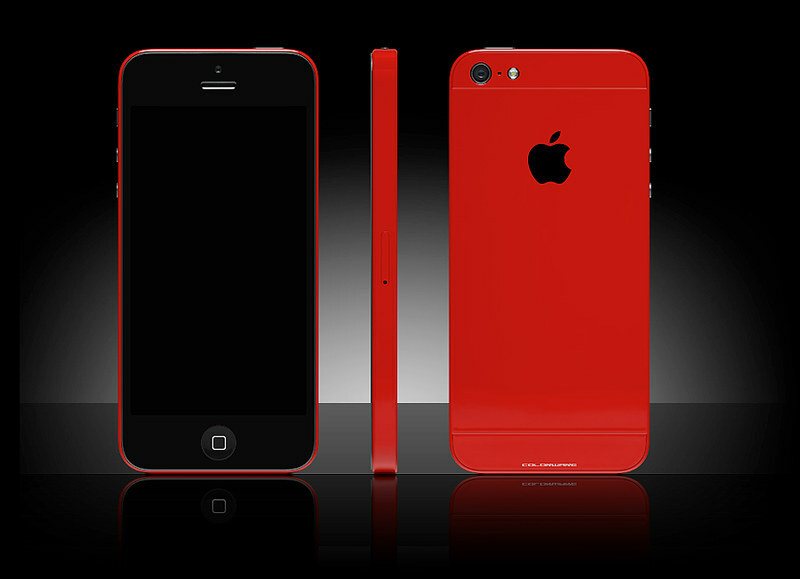 ColorWare is now offering customized iPhone 5 mods for a cool $1,700 price tag which includes a new GSM factory unlocked device in the colorific palette of your choosing. The company is quoting 5 weeks for delivery. I would bet it all on red. It just doesn't get any better than this.